After the dust of this holiday season settles, it’s very likely we’re going to be looking at yet another quarter for the mobile industry that was dominated by Galaxy and iDevices. In a new report, IDC says Samsung and Apple(s AAPL) will continue to lead the way in smartphone and tablet sales this holiday quarter as part of an estimated 362 million mobile devices shipped worldwide, which will be worth $170 billion, both records for the industry. The predictions, which also include estimates for PCs, are informed by the expectation that a lot of people are going to unwrap mobile device gifts this month: Tablet shipments are expected to increase 55.8 percent this holiday over last year’s; smartphone shipments are expected to jump 39.5 percent in the same time frame, according to IDC’s Worldwide Quarterly Smart Connected Device Tracker, published Monday. And yes, this all continues to happen at the expense of PCs, IDC says. Total expected shipments this holiday quarter of 362 million devices would be a 26.5 percent increase over the same period a year ago. It would also be a big step up from the last quarter, which also broke records. 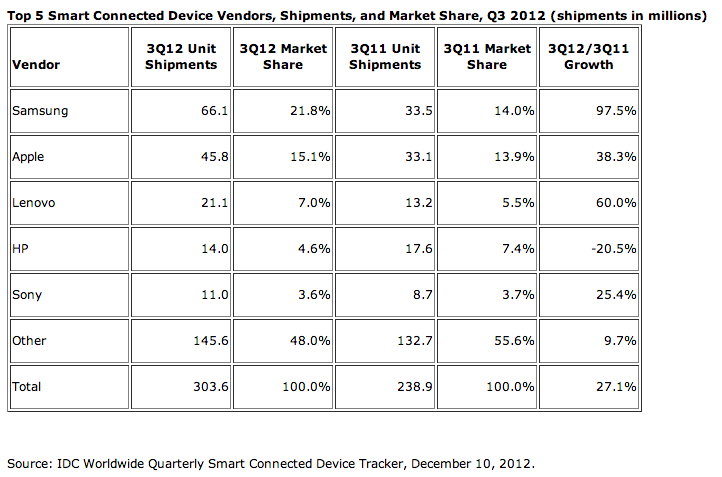 The third quarter of 2012 saw 303.6 million mobile devices shipped worldwide, worth $140.4 billion. As the above chart shows, worldwide connected mobile device shipments continue to be mostly a battle between Samsung and Apple. Samsung currently leads with about 22 percent of the worldwide market, and Apple is next with 15 percent. However, Apple continues to dominate in profits: IDC says Apple devices commanded an average selling price of $744; Samsung’s $430. Together, the two account for close to 40 percent of all connected mobile device shipments. Lenovo, which is in third place, continues to see major growth in its shipments, but its market share is still half that of Apple’s and a third of Samsung’s. Numbers like these helps explain why Apple and Samsung continue spending millions on court battles all over the world — no one else is remotely a threat to their dominance in sales or profits. – the numbers include smartphones, tablets and traditional PCs , including desktops so get rid of the “mobile devices” part since that’s quite a different stat. As a sidebar, it’s interesting to note that the prices of tablets, smartphones, and Windows laptops are converging in the $299 – $799 range.